Our flights to the Dominican Republic were with British Airways, in economy class. We were on the flight for approximately ten and a half hours due to the fact that we went via Antigua, where we were on the ground for an hour to allow people going to Antigua to get off and new passengers to board for the hour-long flight to Punta Cana. The service and in-flight entertainment were very good on board, but the food was quite disappointing. On arrival at Punta Cana, you instantly get that tropical feel as the airport is open air. This tells you that they don’t really have a bad season here; it may just get a little cooler in December. The language is Spanish and everybody is really friendly. Visitors are required to pay $10 on arrival as you go through passport control. 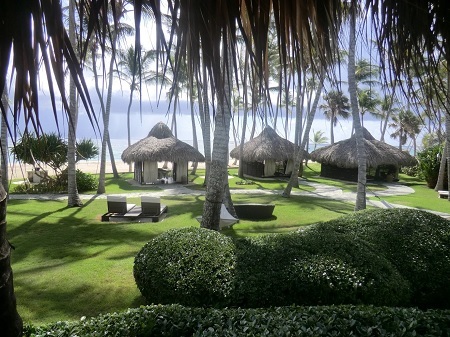 I was very impressed with the Club Med Punta Cana. We were all allocated our own rooms and mine was an air conditioned, family room, which was very spacious and spotlessly clean. The bathroom had a double vanity unit, a really big walk-in shower and a separate toilet. There was also a large dressing room area and a safe. The main bedroom had a king-sized bed and there were sliding doors to a separate room with two sofa beds and there was also a decent-sized balcony with table and chairs. The accommodation blocks are two-storey, painted in pretty pastel colours and set in lush tropical gardens; some with sea view, some with garden view. If preferred, there is a 5-star option which gives guests their own private luxury space with an exclusive infinity pool overlooking the sea. Here, snacks and drinks can be served by the pool, champagne is included and you have your own concierge service. We stayed within the resort as everything you could possibly want was there i.e. food, drink and activities. The only time we left was when we went on the Langosta Del Caribe boat trip, which was absolutely fantastic. It was a four-hour trip which also included a delicious lunch of lobster, chicken, salads and fresh fruit. It was also quite exciting to sail past Antonio Banderas’s beach house. We also took the opportunity to do some snorkelling; all the equipment was provided at a cost of approximately £24.00 (Club Med kindly paid for us all to go). I loved everything about the trip. I cannot think of anything; Club Med have got it just right. I was so impressed by the Dominican Republic. I have always been dubious about recommending this destination, but I couldn’t have been more wrong. Punta Cana is a paradise resort; all you can see when you are lying by the massive lagoon pool are the coconut groves, the glistening Caribbean Sea and the white sand beach. On some days, the chefs will just set up a barbecue on the beach, whilst you can work up an appetite doing Aqua Zumba or Aqua Gym in the sea. The Pool area was one of the nicest I have ever seen. All the sunbeds were wicker with thick comfortable mattresses and the pool towels are changed daily. I cannot imagine another all-inclusive to rival the Club Med concept. After all, they are the pioneers and in my opinion, they have got it just right. Nobody should have any hesitation in travelling to this resort. You could literally have a dream holiday dining on gourmet cuisine (as good as the cruises I have been on); the drinks and cocktails are all brand names, not cheap imitations. Learn lots of new sports with excellent tuition, with activities starting at 8 am and finishing in the evening with a show in the open-air theatre at 10.30 pm. Unless you go on an excursion or want to buy a souvenir from the shop you shouldn’t need to spend any money at all. 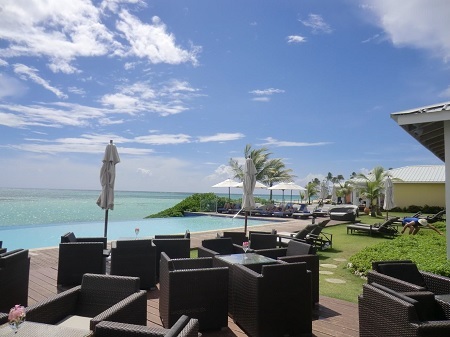 I would recommend this destination to those who want an action-packed holiday or a relaxing beach break, as you can quite easily experience both at the same resort; there is something for everyone. I would even recommend to singles as it is so friendly. Thank you to Club Med for hosting this wonderful trip and to Fred. Olsen Travel for allowing me to go. The Dominican Republic has a great climate all year round and so this makes it the perfect destination for some winter sun. If you would like us to help plan your holiday to this part of the world then our in-store agents will be more than happy to help. Conversely, you can fill in one of our contact forms online and we will get back to you with some great options for you to choose from.